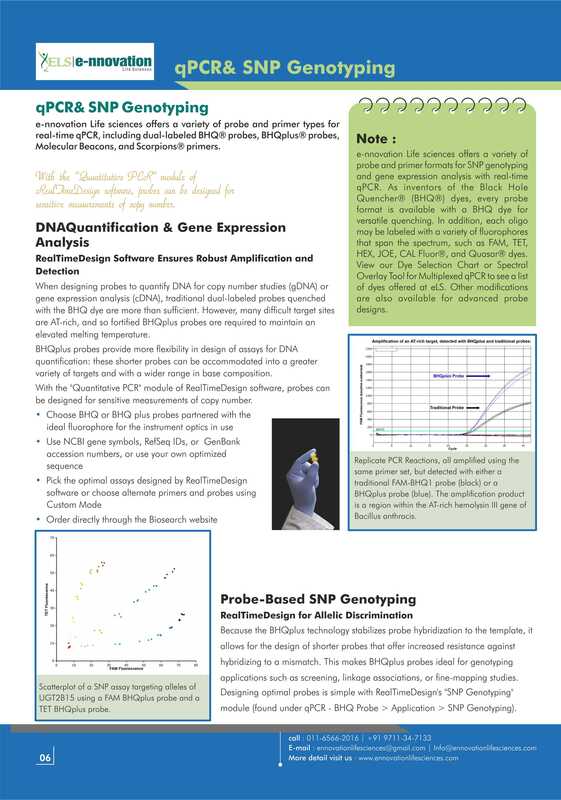 e-nnovation Life Sciences offers a variety of probe and primer for real- time qPCR, including dual-labelled BHQ ® probes, BHQplus® probes, Molecular Beacons, and Scorpion® primers. While designing probes to quantify DNA for copy number studies (gDNA) or gene expression analysis (cDNA), traditional dual-labeled probes quenched with the BHQ dye are more than sufficient. However, many difficult target sites are AT- rich, and so fortified BHQplus probes are required to maintain an elevated melting temperatures. BHQplus probes provide more flexibility in design of an assay for DNA quantification, these shorter probes can be accommodated into a greater variety of targets and with a wider range in base composition. With the “Quantification PCR” module of Real Time Design software, probes can be designed for sensitive measurements of copy numbers. 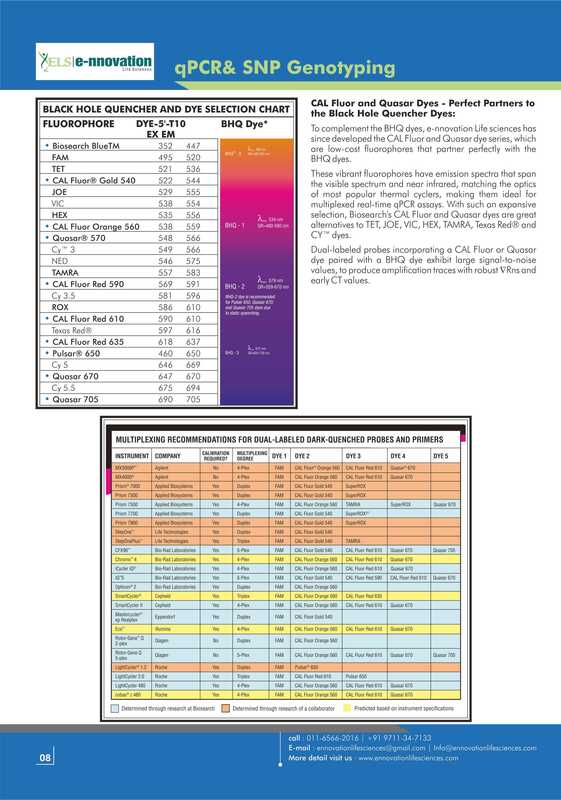 Choose BHQ or BHQ plus probes partnered with the ideal fluorophore for the instrument optics in use. Use NCBI gene symbols, RefSeq IDs, or GenBank accession numbers, or use your own optimized sequence. 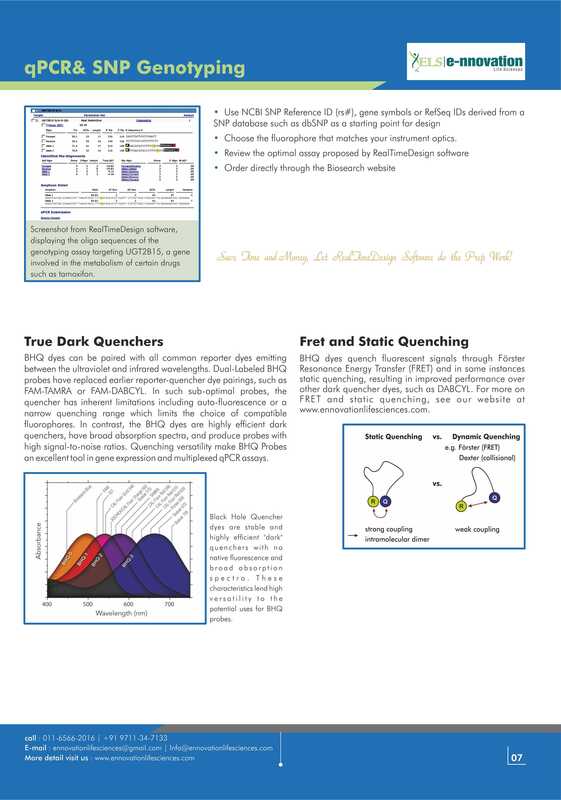 Pick the optimal assays designed by Real Time Design software or choose alternate primers and probes using Custom Mode. Order directly through the Biosearch website.